Mr. Holmes has been touted as being one of the very best Sherlock Holmes films of all time, and it’s easy to see why. The film is a poignant study of character, and as such takes us on a fascinating journey into a character we all know well already (or at least we think we do). Ian McKellen’s acting chops are inarguably without reproach, and his immense talent shows here, as he portrays Sherlock Holmes at three different advanced ages, and the subtleties and intricacies of complex emotions during each age. The film’s “present day” takes place at Holmes’ famous retirement cottage, complete with beehives, as 92-year-old Holmes cultivates a friendship with his housekeeper’s son and battles his own loss of memory. There’s a mystery from his past, that he’s sure didn’t end the way Dr. Watson had written it; problem is, he can’t remember the facts. This mystery is a big deal to him, as it was the last case he took, and was in fact the reason for his retirement. But what happened? What went so wrong it forced the greatest detective out of London to keep bees in the country? Thing is, as compelling as that plot line sounds (and is), it’s not actually the centre or indeed the most important part of this movie. What makes Mr. Holmes so compelling is the character study: the most brilliant man in the world (literally) losing his mind; the mistrust of the housekeeper watching her son learn about bees and spend too much time with Holmes; the softening of a person famous for scorning affection as “the grit in the sensitive instrument,” questions of morality and especially mortality, and the crisis moment when sharp deductive work is suddenly more important than it ever has been. 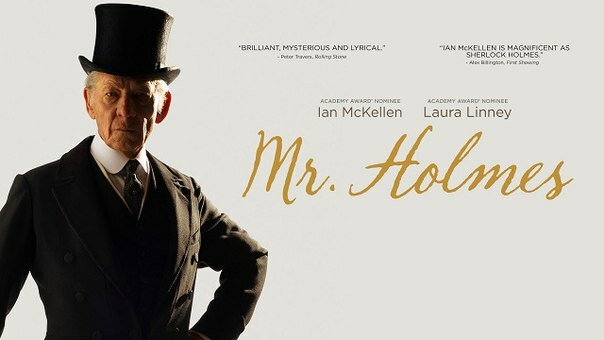 I highly recommend Mr. Holmes to anyone, Sherlockian or not, as it’s an incredibly well done movie. I have not yet read the novel upon which it’s based (A Slight Trick of the Mind by Mitch Cullum), but I may have more comments for you all once I do. I had the honor of hosting the talkback for this movie here in Boulder. Here’s my review of it.